GPS Radio Occultation (GPS-RO) is an effective technique for measuring properties of the Earth’s atmosphere from space, and one that has demonstrated significant improvements in weather forecasts, climate modeling and space weather prediction. A radio signal transmitted by a GPS satellite in medium Earth Orbit (about 12,500 miles above the planet) is bent as it travels through the Earth’s atmosphere, and is then received by a satellite in low Earth orbit (LEO) less than about 1,200 miles above the planet. This bending, the amount of which is determined by the density of the atmosphere, causes the signal to travel a longer path through the atmosphere. Although the receiving LEO satellite cannot “see” the bending angle of the signal as it is blocked from view (or occulted) by the atmosphere, it can calculate the angle based on the delay in the signal’s arrival. The bending angle can be used to calculate the atmospheric density along the signal’s path, which in turn can be used to calculate temperature, pressure, humidity and electron density. With enough satellites in orbit, GPS-RO provides global coverage of temperature, pressure, water vapor and electron density profiles from near the Earth’s surface to the top of the atmosphere. What Are the Advantages of GPS-RO? 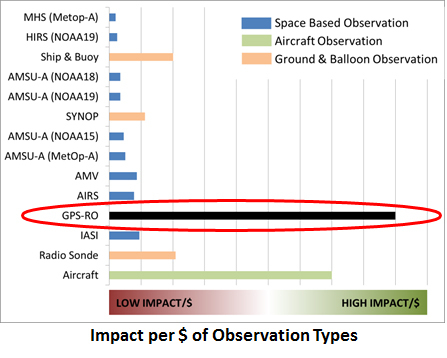 GPS-RO data is among the top contributors to model forecast accuracy while costing the least to produce, in part because of the many GPS satellites already in orbit around Earth, and the relatively low cost of building and launching the receiving satellites. Assimilating GPS-RO data into weather models also improves the forecast impact of other data, especially for extreme weather events. What Are the Real-Life Impacts of GPS-RO? Better weather forecasts help people make better decisions that save lives, save money, protect buildings and critical infrastructure, and enhance quality of life. GPS-RO observations not only make routine weather forecasts more accurate, but also significantly improve predictions of natural disasters and other high-impact environmental events. In the important area of hurricane prediction, for example, experiments show that GPS-RO can play a key role in achieving the U.S. National Oceanic and Atmospheric Administration (NOAA) goal of reducing average track and intensity errors by 50% in 10 years. Such improvements would allow public safety officials to act earlier and with more precision to evacuate and protect coastal areas. GPS-RO has also shown the potential to improve regional forecasts for heavy precipitation from non-tropical storms, especially downwind of areas where traditional observations are scarce, enabling forecasters to better anticipate severe flooding and related impacts. In addition, GPS-RO measurements support improved space weather forecasts important to numerous industries and our everyday way of life, which is increasingly dependent on technologies vulnerable to solar storms. Power grids, aviation systems, communications and navigation satellites, and military operations are all susceptible to the effects of space weather. What is the Current State of GPS-RO? Global GPS-RO observations are currently provided by the joint U.S./Taiwan COSMIC mission. COSMIC, which stands for “Constellation Observing System for Meteorology, Ionosphere & Climate,” consists of six small LEO satellites launched in 2006, each carrying a GPS-RO receiver and ionospheric photometer. GPS-RO observations have improved weather predictions at many national forecast centers around the world (Fong et al., 2011) and have been declared a No. 1 priority by NOAA. Hundreds of users from more than 50 countries now depend on GPS-RO data and derived information. At the same time, the COSMIC satellites are now degrading and approaching the end of their operational lifetimes, while follow-on systems have encountered delays and funding issues, and are insufficient to meet the current and future demands of weather forecasting, climate monitoring and space weather prediction. What is the Future of GPS-RO? Improvements in weather, climate, and space weather forecasts made possible by GPS-RO data are becoming even more critical with the increase in extreme weather and related impacts on people, property and economies. Meanwhile, serious gaps in GPS-RO observations and other types of environmental data are already developing and expected to get worse due to skyrocketing costs and schedule slips associated with government-led satellite programs. 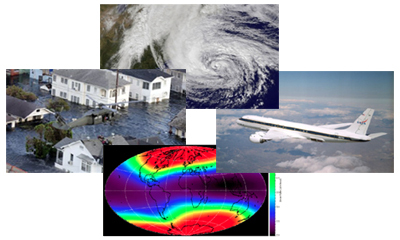 PlanetiQ represents a new model of collaboration between public and private stakeholders, one that leverages private funds to field new observing systems for GPS-RO and other data quickly and at lower cost, in order to sustain and increase collection of the environmental data required for accurate forecasts, early warnings and informed decisions, with less technical and financial risk to public and private customers worldwide.